Each player will receive an Unbroken Bonds prerelease kit containing 4 booster packs of Pokemon Unbroken Bonds, a Promo card, and a special Evolution pack. At the completion of the event, each player will receive an additional 3 Unbroken Bonds booster packs. 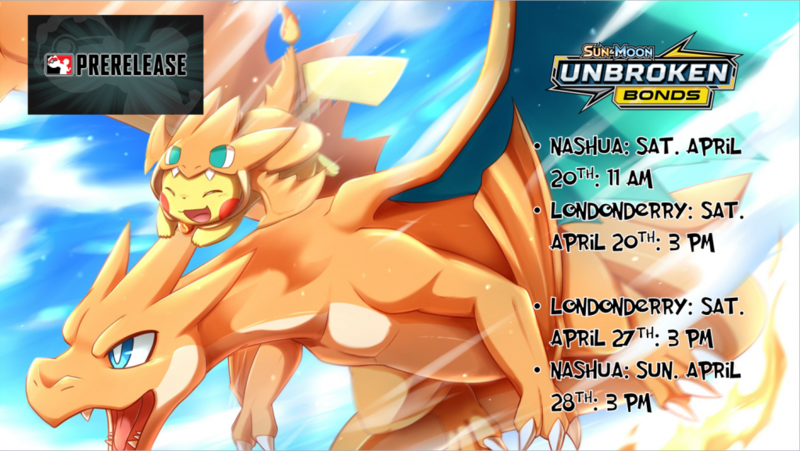 There are several events during prerelease weekend. Nashua will host events on Saturday April 20th at 11 a.m. and on Sunday April 28th at 3 p.m.. Londonderry will host events at 3 p.m. on Saturday April 20th and on Saturday April 27th at 3 p.m.. The stores open at 10 a.m. for on-site registration in each case.